Can you have too much of normal? 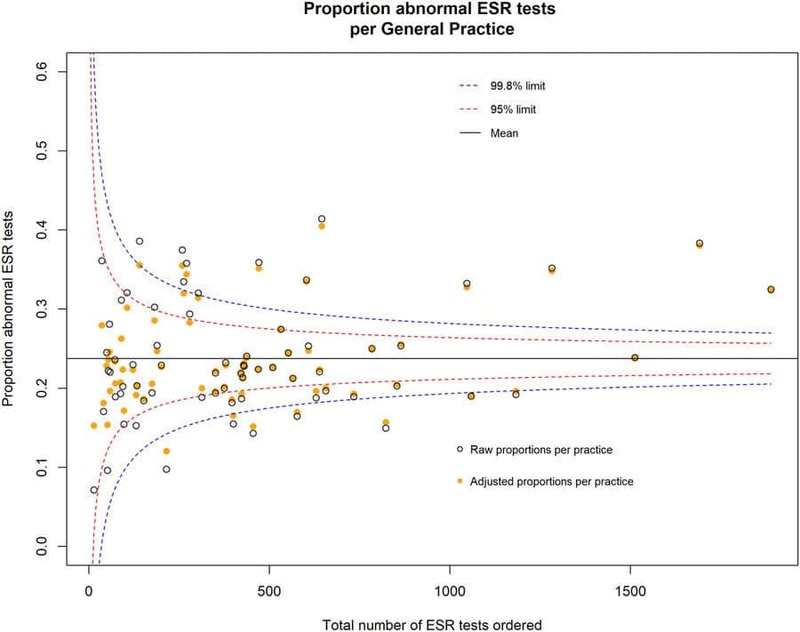 We recently did a study1 that tried to identify General Practices that ordered a higher proportion of tests that returned a “normal” (within the reference range) result, compared with their peers. The UK’s National Health Service (NHS) is currently struggling to remain financially sustainable; rationing of services have begun to try and meet the required £22 billion in efficiency savings.2,3 It remains difficult to determine, on a population level, if a healthcare resource is being used appropriately. We thought both general practitioners themselves and policy makers may be interested in identifying general practices that order a higher proportion of tests that return a normal result. We retrospectively analysed all C-reactive Protein (CRP) and Erythrocyte Sedimentation Rate (ESR) tests requested from Oxfordshire General Practices from January 1st 2016 to December 31st 2016. 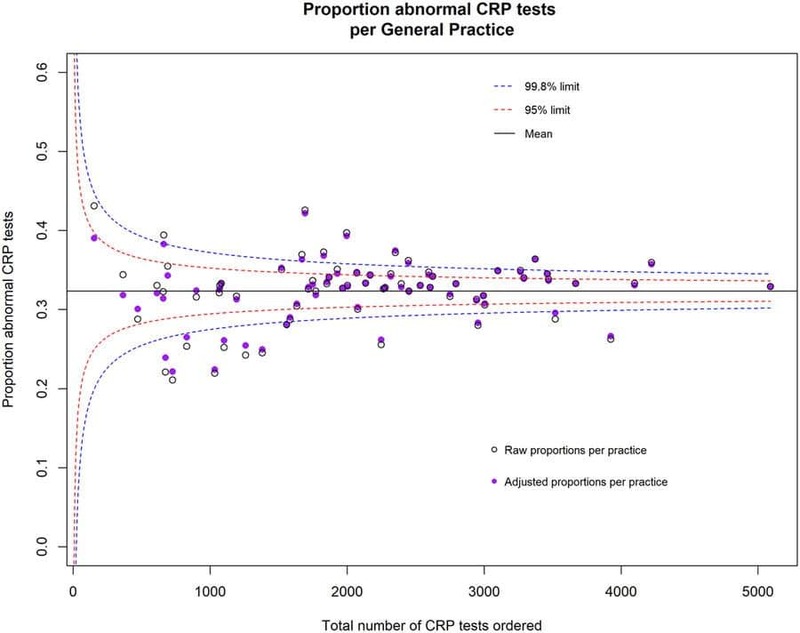 We then calculated the proportion of CRP and ESR tests that returned an abnormal result for each individual general practice, as well as the mean proportion of CRP and ESR tests that returned an abnormal result across all the practices. After adjusting for difference in general practice populations, we identified general practices that had a proportion of abnormal test results below the 99.8% control limit (3 standard deviations from the mean of their colleagues). We analysed 143,745 CRP and 30,758 ESR tests from 69 practices. In Oxfordshire, we identified 12 and 7 practices that ordered a higher proportion of CRP (figure 1) and ESR (figure 2) tests that returned a normal result (were below the 99.8% control limit), respectively. We envisage that data comparing the proportion of abnormal test results could be used as a feedback tool to give GPs information about their use of tests or for monitoring of GPs at a CCG or national level. Our results, however, requires judicious interpretation in the context of population and patient data. In this regard, we do not want our data to imply that GPs three standard deviations above or below the mean of their colleagues are ordering CRP and ESR tests inappropriately. Appropriateness of test ordering should be judged using patient level data; our data can only determine GPs that would benefit from patient-level audit. 1 O’Sullivan JW, Heneghan C, Perera R, et al. Variation in diagnostic test requests and outcomes: a preliminary metric for OpenPathology.net. Sci Rep 2018; 8: 4752. 2 Alderwick H, Robertson R, Appleby J, Dunn P, Maguire D. Better value in the NHS The role of changes in clinical practice. 2015. 3 Scrutton J, Holley-Moore G, Bamford S-M. Creating a Sustainable 21st Century Healthcare System. 2015 http://www.ilcuk.org.uk/images/uploads/publication-pdfs/Creating_a_Sustainable_21st_Century_Healthcare_System.pdf.